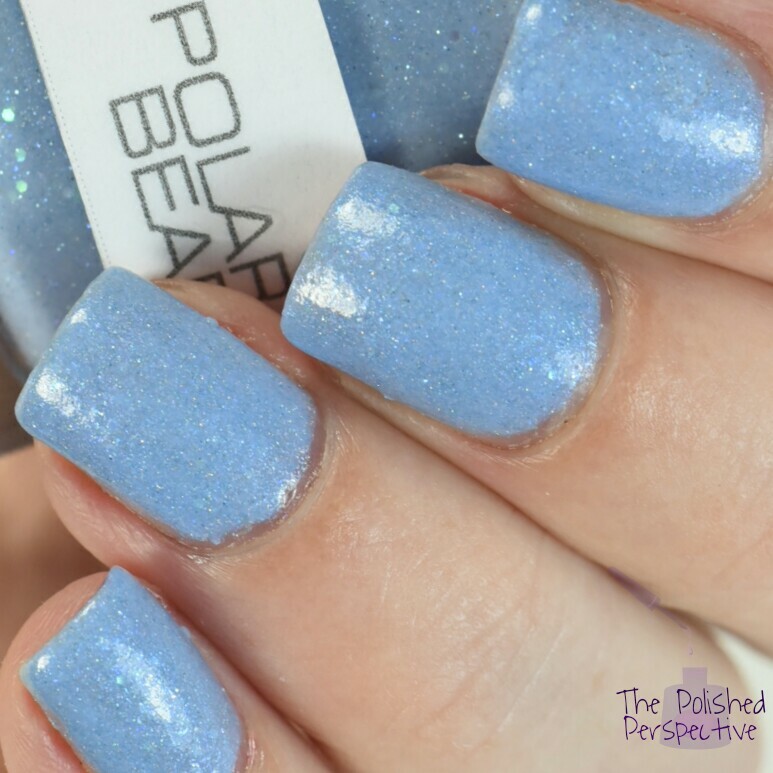 Polar Bear is a light sky blue shade with a lot of different sparkly glitters. The glitters are small in size with none of the chunky glitters. 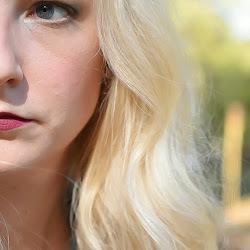 It's a beautiful shade of blue and a true light blue without much dustiness that some lighter shades have. Look at these glitters! I love the combination of micro glitters! Don't use INM Out The Door with this polish, it will cause some crazy tip wear. I was like, "Hmmm, maybe I can make my watermark disguise that ugly tip wear." That's not subtle is it? 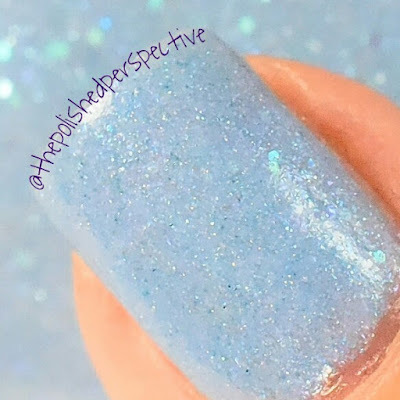 This is a color changing polish; however, I had a hard time getting much of a color change. It's hotter than hades in Kentucky and really effing humid too. It's supposed to change from sky blue to turquoise. I did get a slight change in really iced water, but as soon as I pulled my hand out and put it in front of three daylight bulbs, I didn't have much luck. I don't want to say this doesn't change, because the weather just isn't conducive to playing with thermals. But, I dunno. I'll have to try again when summer's over. 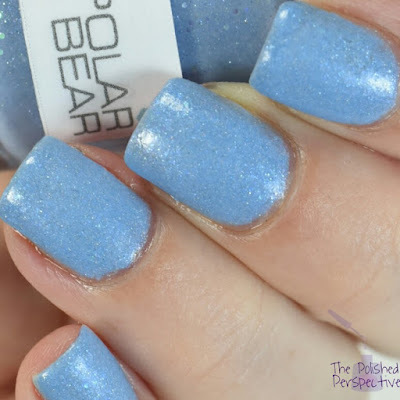 Polar Bear is also a glow in the dark polish. So much fun! 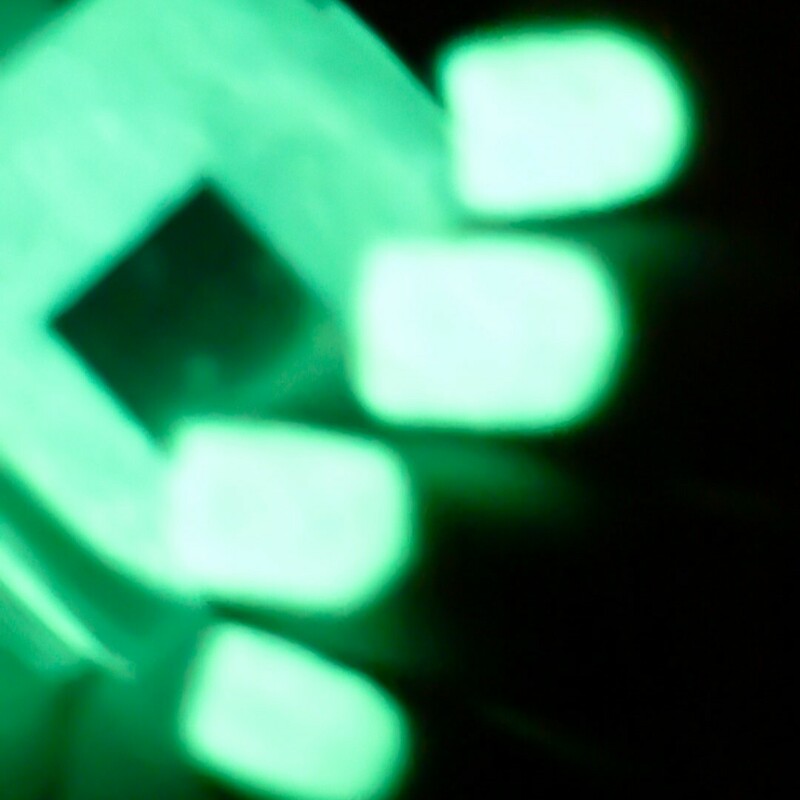 It's been awhile since I've used a GITD polish and I fully prepared myself for what the formula might be like. 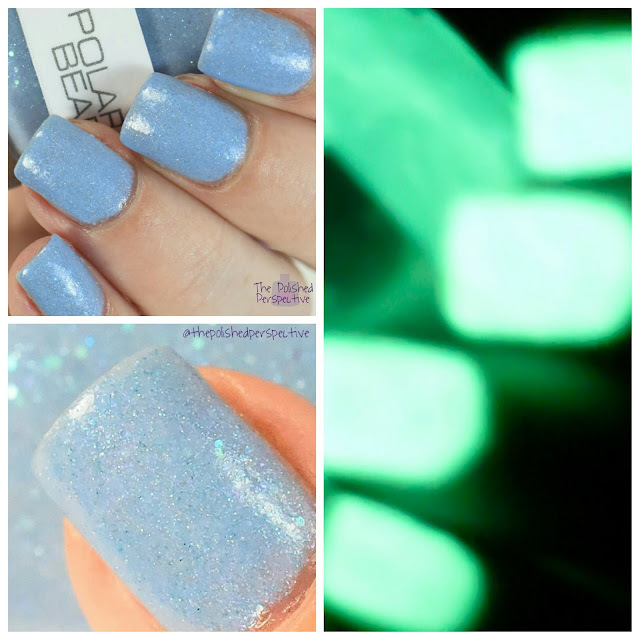 I have used a few GITD polishes in the past and the formulas are thicker and just slightly slower to dry. 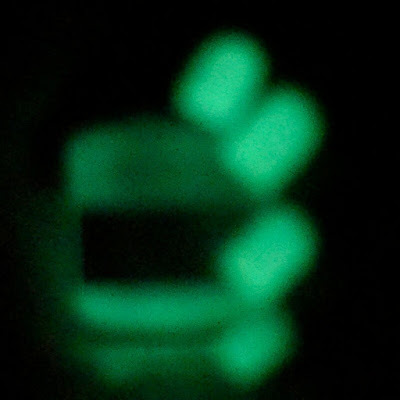 I remember reading a thread where an indie polish maker explained that the ingredient that makes the polish GITD is what causes the thicker consistency. I'm not a maker. I'm not a GITD polish aficionado, but that explanation seems on par with my experience with GITD. Due to the thicker nature of the polish, I applied one thin coat and allowed it to dry completely. Then I slapped on a thicker coat. I didn't have a problem applying this polish. It dried a little slower than just a regular crème polish. I had to try to take a picture of this glowing. That ish was hard. It was late, and I tend to stare off into space when I'm tired. I ended up staring at the light while I was charging the polish and then I couldn't see through the view finder. I'm not that dumb, I swear, I blame tiredness. I gave up after a bit, but here's a couple shots. Overall, I really like this polish and I'm glad I bought it. 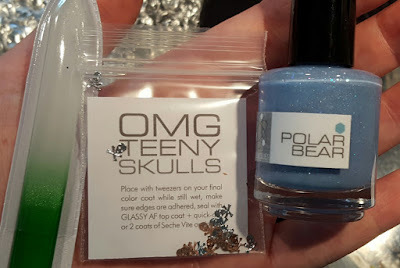 I don't own any thermal AND glow in the dark nail polishes, and I didn't even know they existed before stumbling on the swatch pic! The formula is a bit thick but I was able to apply it easily. The shipping time was really fast and I received some really cute goodies. I couldn't help myself, I took a phone picture after I open my package to show my nail fraaannnds. I'm really happy with my first Nerd Lacquer purchase and I'll be buying again! Great review! I love this polish and the GITD is super cool!